I watched the Starving Artist Tag YouTube collaboration videos by Mira Byler, Lena Danya, Happy D. Artist, Katherine Ward Art, Tina Yu and Katie Jobling and decided to take part in the tag in blog format. 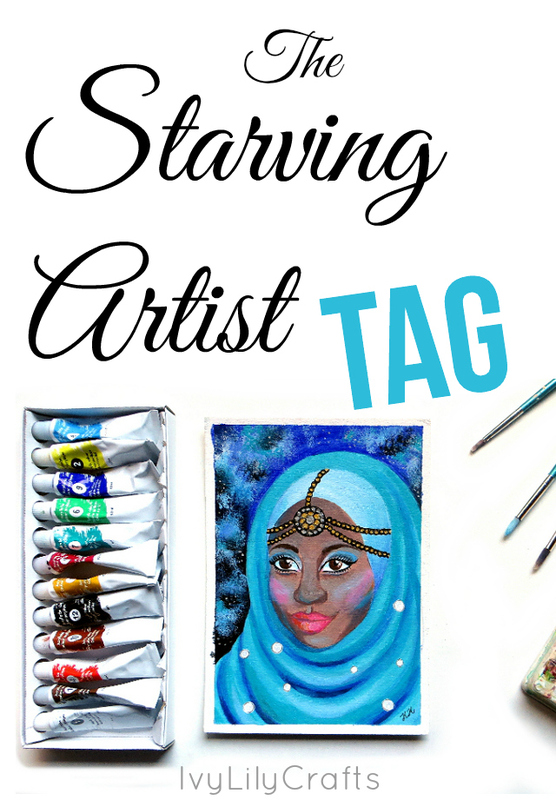 The Starving Artist tag is a way to get to know other artists by answering 20 questions about your art journey, inspirations and art creation. 1. What's your favorite experience as an artist? I love painting and listening to an audio book on the background. (At the moment I'm re-listening to Stieg Larsson's The Girl Who Played with Fire.) And the moment when a painting starts to look good, because they never do in the beginning. 2. What's your least favorite experience as an artist? When I show someone a painting in progress and they think it looks weird, cause they can't see where it's headed. 3. What are your dreams/goals for your art? My dream is to make a living or a significant part of it on my art, creativity and other related income streams: selling coloring pages, art prints, originals, ad and affiliate income and more ways in the future. 4. Whats your favorite medium and why? My favorite mediums are watercolor and acrylics. I like both of them cause they're easy to start with. You don't have to have any special solvents or mediums, when you start out. Paper, paints, brushes and water is enough. 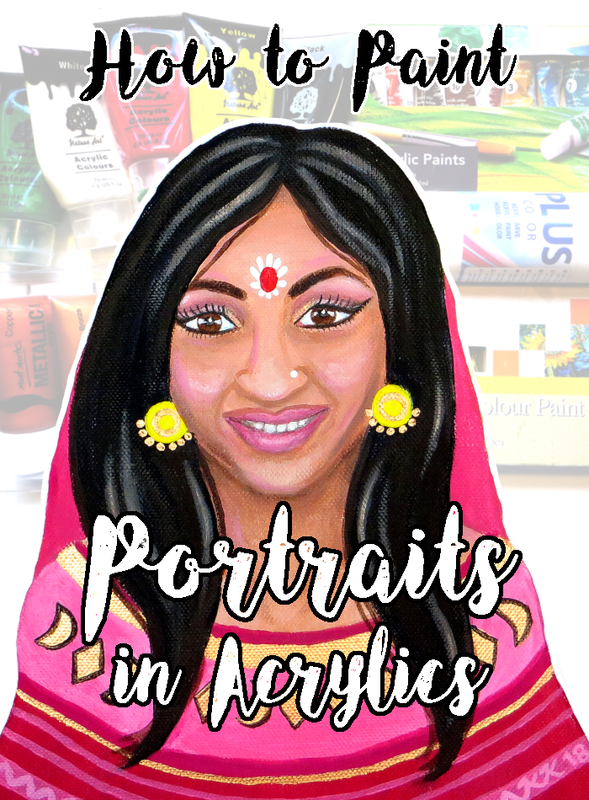 I also like acrylics for the bright, intense colors and the fact that you can paint on so many different types of surfaces. I'd like to try oils one day too, but probably water soluble ones to avoid the toxic solvents. 5. What inspired you to do art/why do you love it? I always loved drawing as a child. I picked it up again, when I was about 10 years old and started drawing celebrity portraits (very bad ones) and later watercolor portraits. During my second year at the university I felt I needed a new hobby or an outlet and started practicing art more seriously with different mediums and posting it on deviantART. 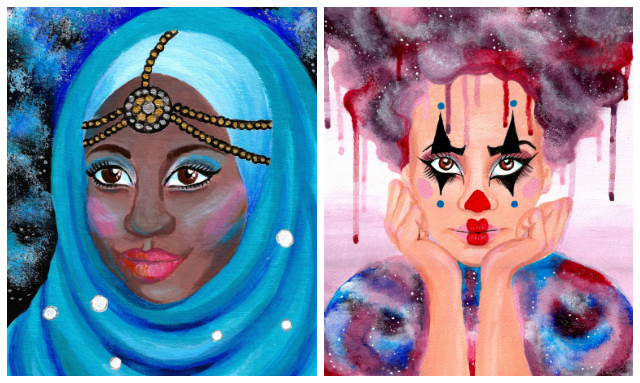 Eid and Galaxy Clown acrylic paintings. 6. What's the favorite piece you ever made and why its special? I think my favorite piece is usually my newest piece as it should be, cause I'm (hopefully) getting better. But the Galaxy Clown painting I made last spring is also special. It was an assignment so I had to plan it out following the guidelines, search for ideas and references, come up with a pose idea and finish the painting in a set time frame. It showed me that I could do art professionally and I also loved the clown concept, but might have never done it without that assignment. 7. Who/what are your biggest art influences? I love children's book illustrations by artists like Mauri Kunnas. 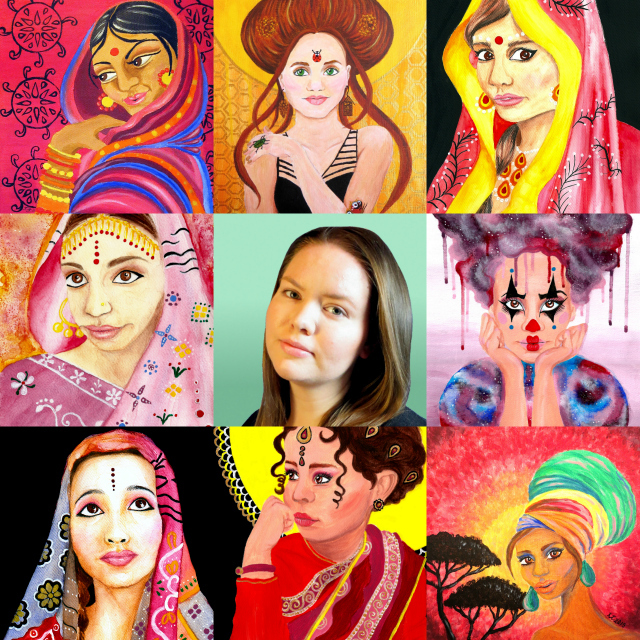 My favorite YouTube/online artists are Leilani Joy, Tanya Shatseva, Mira Byler and Malinda Prud'homme among others. I've listed more YouTube artist favorites here and here. I just recently found Annelie Solis who uses such beautiful colors schemes. 8. What did you learn from being a full time artist? I'm not a full time artist, but I'm learning more about art creation and business all the time. I'm taking Leilani Joy's online art course, The Art School Express: A Fast Track to a Pro Art Portfolio!, at the moment and learning more about design, composition, value, figure drawing, color etc. 9. What do your family and friends think about you being an artist? I think this relates to the answer of question 12. 10. Was becoming an artist your childhood dream? If not what is? Yes, it was one of them. I also wanted to be a children's book author. 11. What advice can you can give to people who want to be more artistic or creative? Learn through art classes, books, online courses, YouTube videos, art online communities (such as deviantART), blogs and practise. 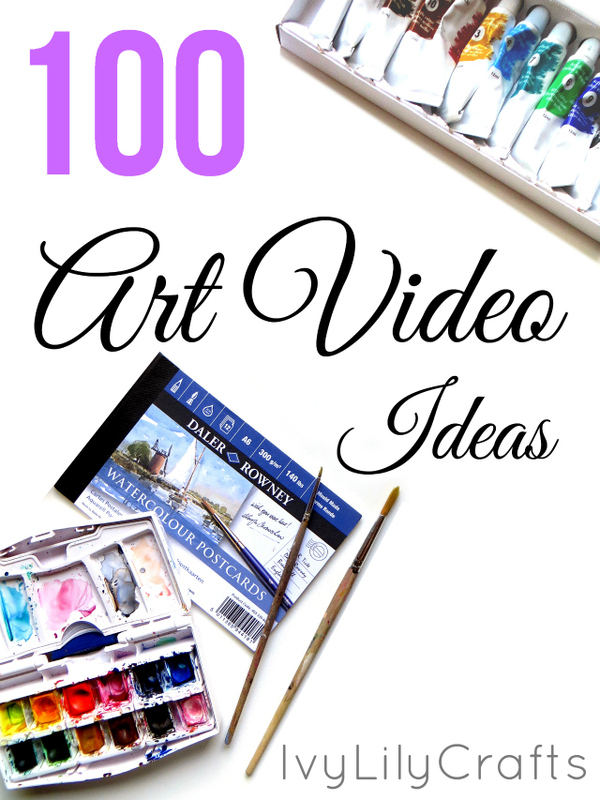 I've listed some of my favorite art books in the art supplies blog post. 12. Were you supported to pursue art as a child? I was supported to pursue art as a hobby, but told it's not a real job. 13. Do you make money off your art? Yes, I sell coloring pages on Etsy and art prints on Redbubble, Society6 and Artflakes. Getting a sale is always a great feeling. It turns a bad day into a good one knowing that someone liked your work enough to buy it. I've also tried selling my original paintings, but I'm not doing it at the moment. I've found that it's harder to get traffic (and rank high in search) on original paintings than coloring pages on Etsy. I had better luck with a Finnish site (Taidesivut.net), but didn't continue after my free trial. Making a new patterned background for my clown sketch. 14. What do you want to improve on/aspire to be with your future art? I'm currently making sketches in preparation for Inktober and a Halloween painting and I'm concentrating on improving in design and color. I want to learn to use pleasing color schemes and expressing emotion through color, to make the figure pop from the background and make the overall composition interesting. I feel like my past paintings have been hit and miss and I'm finally realizing that there's a science to making good art - and I want to learn it. 15. What feelings do you try to express in your art? My art is usually more upbeat, positive, colorful and happy than dramatic or sad. Art vs. artist tag from Twitter and Instagram. 16. What is your favorite thing to paint and why? My favorite thing to paint is girls or women. I love painting women of different cultures, but also nature themes. I find different cultures interesting and nature (forests, gardening, flowers, lakes...) is important to me for relaxing, clearing my mind and coming up with new ideas. 17. What's the strangest thing you've painted? I'm drawing a blank. Maybe an ostrich's head coming out of the living room floor for a surrealism sketch (I didn't actually paint it). 18. 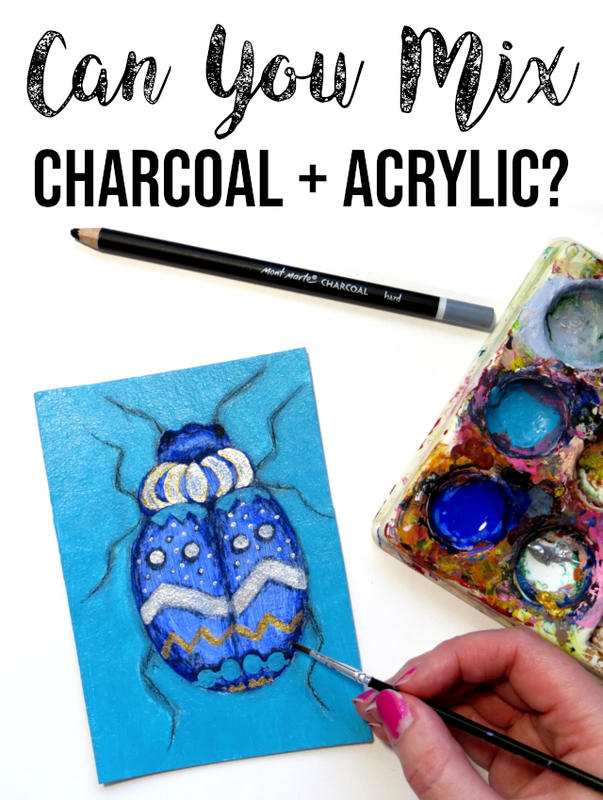 Have you ever been hung up after you started a commission, and how did you handle it? 19. Do you admit that paint smells good? 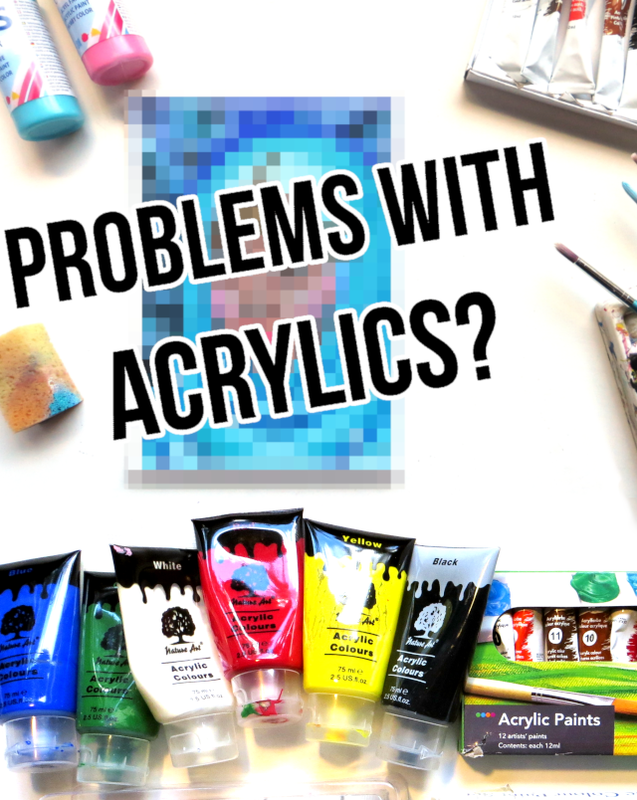 Watercolor paints don't smell and with acrylics it depends on the brand. 20. What would you tell your younger self? Post your art online sooner, learn to take criticism. Don't keep your art a secret. Learn more about art mediums and art creation sooner. Don't be too attached to your art.